Great build and style is an HTC hallmark and the HTC Desire C is no different. While the HTC One range - comprising the HTC One X, HTC One S and HTC One V - has thrilled Android fans, there's a huge market for first time Android users, upgrading to a smartphone for the very first time and they demand a good looking smartphone and a decent user experience. There's a lot to be said for attention to detail and great design. 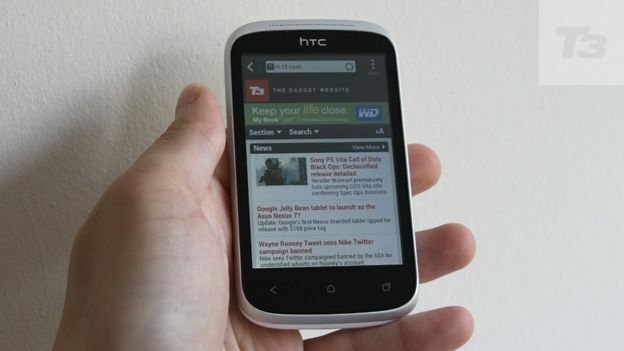 The HTC Desire C has both and works with the Android newbie in mind. You'll instantly notice the lack of a flash on the striking white (or black) unibody design but the 100g weight feels just right in the hand. The solid build and subtle curves have become the trademark style of HTC. You simply won't see an HTC phone with average build and the HTC Desire C makes rivals like the Samsung Galaxy Mini 2 look like cheap toys in comparison. The volume rocker blends in to the right hand side of the smartphone while the MicroSD card slot is behind the phone cover, beside the surprisingly striking red battery and colour matched internals. Again, it's the attention to detail that really make the HTC Desire C feel like a premium smartphone. The real difference against rivals is the screen - it's 3.5 inches and boasts a 320 x 480 resolution but is brighter and features better viewing angles than smartphones with a similar spec. Android 4.0 runs well using an average 600Mhz processor and the HTC Sense 4 interface works brilliantly. NFC and Bluetooth 4.0 functions are nice additions but will largely go unnoticed for many users. The 5 megapixel camera is a more obvious sell for the consumer and HTC has made sure it's a good one. The lack of flash is a problem but it's very fast and uses a variety of HTC shooting modes which mimic Instagram functions like Sepia, Solarize and Negative. Beats audio tech isn't hugely useful without Beats headphones (there's bog standard Apple style HTC headphones in the box) but the 4GB storage and MicroSD card slot make the HTC Desire C another great music phone from HTC - it handles virtually all music (and movie) file formats too. Like all HTC phones, you'll also get a 2 year 25GB subscription to DropBox for free. The 320 x 480-pixel resolution isn't the highest around but the 3.5 inch display is clear, bright and usable at all angles. Response time is excellent and runs close to the edge of the body and isn't deeply recessed like some lower priced smartphones. Using at AnTuTu app to bechmark performance, the HTC Desire C scored 1992. As a yardstick, the £230 HTC One V managed 2458 but we've seen smartphones with a bigger score than the HTC Desire C struggle to fly through menus and apps as quickly. You can expect a day and a half of use from the removable 1230 mAh battery which means the HTC Desire C sits in the higher-end of battery life ability charts against smaller smartphones - the exception is the impressive Motorola Defy Mini. The biggest rival the HTC Desire C faces is, ironically, the HTC One V which costs a little more but boosts screen size, processor and more for around £50 extra. If decent performance from a palm sized phone is key, the the HTC Desire C is an excellent choice with a quality build and Android 4.0 skills out of the box.